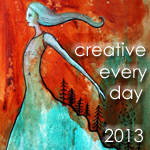 Ways to share: Once you've signed up, you can leave a comment on this post and/or use the "Mr. Linky" widget below to link to a blog post(s) about your creative activities during the days of 9/30/13 - 10/6/13. Theme: September's totally optional theme is Rhythm, which you read more about here. It feels so good to be back here, sharing my art for the second week in a row. I suppose I am gearing up for November, eh? Thanks in advance to those of you who visit and comment on my post. It always makes me so happy to meet new people and renew old friendships with such creative people. Always grateful for you, Leah! I’m back after a longish absence as well! I can’t believe it’s been almost a year since I took the plunge and participated in AEDM. I can’t wait for November to roll around again! Looking forward to seeing what everyone’s been up to. Thanks, Leah! I haven’t been here in a while but I have been very busy creating. It looks like my thumbnail will not appear but you can still click on the URL to see my new comic. It’s just the pencil sketch so far. Enjoy. I take that back. I can see the thumbnail now.